WHENEVER Islam’s apologists blather, prattle on, about the “religion of peace”, think about all the flying heads! Hardly kidding. And for those who don’t have the stomach for such reality talk, no matter, it’s not going to avert the dangers to the west and keep them at bay. Buck up. BUT what’s the point in this discussion, other than to (virtually) smack some sleepyheads from their stupors? Yes, as important as it is to awaken fellow patriots, the whys and wherefores are equally intrinsic. In other words, the more info one has the better one can (mentally) equip to deal with whatever comes next. Indubitably, ignorance will only serve to blindside. These Islamic extremists daily take those laws in their own hands, murdering anyone who wants to think freely or differently. Every day, arrests, trials, floggings, torture and the murder of journalists, poets, students and human rights activists are a routine practice. In 2013, a Pakistani Professor of English, Junaid Hafeez, was arrested and jailed on blasphemy charges after a student affiliated with the Jamaat-i-Islami party accused him of insulting Muhammad, the founder of Islam, on Facebook. His original lawyer, Chaudhry Mudassar, left the case in June 2013 after facing a multitude of death threats. His second lawyer, Rashid Rehman, was shot dead in his office in front of his colleagues on May 7, 2014. His current lawyer, Shahbaz Gurmani, has received death threats, including guns fired outside his house, and a letter from the Islamic State (ISIS), warning him against pursuing the case, and stating that he will be beheaded unless he stops. Junaid Hafeez remains in jail. Fatima Naoot is a columnist and poet with a critical mind. She has the courage to speak out against the injustices in her society — traits apparently too threatening for many Muslims. Another Muslim cleric, Sallah Sultan, said in a speech aired on Hamas TV in 2012, that people he meets everywhere “thirst for the blood of the Jews…. Israel used girls with AIDS to seduce young Egyptians and infect them,” he said, evidently without bothering to validate the story, which is just another example of fabricated Jew-hate. Neither cleric has yet been brought to court for proudly calling for genocide, but Fatima Naoot is tried for criticizing the slaughter of animals during Eid al-Adha….read on…. NOW, lest anyone believes their “dreams” of genocide are an anomaly, get that out of your head, while it is still atop your shoulders! In a May 16 interview with Al-Tanasuh TV, Libyan cleric Muhammad Bouajila, a member of the Libyan Ulema Association, explained that in principle, beheadings and body mutilation are prohibited, but that they are allowed under certain circumstances “especially if this serves to strike terror in the heart” of the enemy. Sheik Bouajila further commented that Muslims should fight non-Muslims who refuse to convert to Islam or pay the jizya poll tax. Al-Tanasuh TV is owned by Sadiq Al-Ghariani, Mufti of Libya, who is associated with the Libya Dawn forces. MORE tellingly, as it is written in the Quran (8:12) – “I will cast terror into the hearts of those who disbelieve. Therefore strike off their heads and strike off every fingertip of them”….plus a host of others. Hmm. SO, how many times does it need to be reiterated: ISIS (like each Muslim Brotherhood hydra, and Shia cousins alike) is hardly alone in the beheading phenomenon. After all, they are simply following the Koran – plus leading Islamic nations dating back to the Arabian Peninsula, reverting back a few centuries – into the head chopping arena. Devoted disciples. AND, speaking of the “lovely” Saudis, whose Arabian roots are poisonous to the core – you know, the ones who are mainly responsible for 9/11/01 and all the Wahhabi-based terror taught in U.S. (western) mosques – let’s set the record straight. Primitives. Eighty percent of major mosques in America are under Saudi-Wahhabi influence, according to Stephen Schwartz, Director of the Center for Islamic Pluralism, an organization that “challenges the dominance of American Muslim life by militant Islamist groups” including control of property, buildings, training and appointment of imams, content of preaching, literature distributed in mosques and charitable solicitation. MORE specifically, how many heads flew off, so far, this year in the Kingdom? “Only” 100! On the upside, unlike the brutal, dull-knife beheadings we see carried out by the Islamic State (ISIS) savages, at least the Saudis use a long sword which enables them to smite the head off in one fell swoop. It’s called Heaven Square, but after the Islamic State (ISIS) group started using the roundabout in Raqqa for gruesome public executions it earned a new name: Hell Square. In the year since the jihadist group announced its “caliphate” last June, its de facto Syrian capital of Raqqa has been transformed into a macabre metropolis. 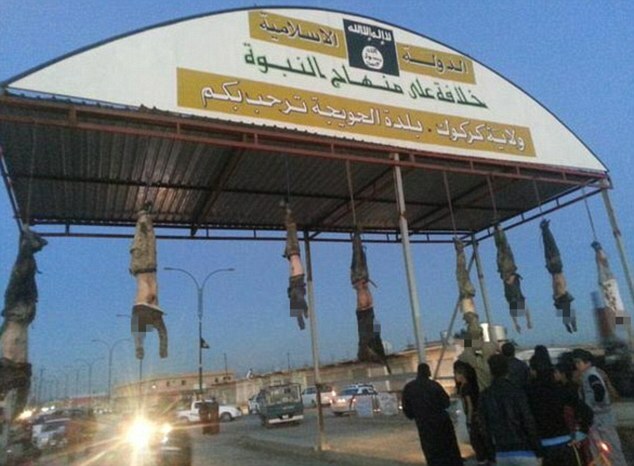 Human heads are displayed on spikes at the central roundabout and crucified bodies hang for days to terrorize local residents, said Abu Ibrahim Raqqawi, a Raqqa resident and anti-ISIS activist. “From the first moment of its control over Raqqa, ISIS adopted a policy of horror and terror, resorting to executions, beheadings, cutting off hands and legs, and crucifixion,” said Raqqawi, who uses a pseudonym. He belongs to the “Raqqa is Being Slaughtered Silently” undergroundactivist group, which documents ISIS abuses in the northern Syrian city and surrounding province. STILL, if beheading seems too far off your radar, perhaps a more “benign” intro to Shariah Law – already making its presence known throughout Europe, and entering Muslim dominated arenas in the U.S. too – will suffice. Think: ice cream! YET, the fact of the matter is that if one thinks that Islamic barbarians can’t top themselves, you would be (deadly) wrong. Moreover, Americans (westerners) can’t afford to pretend that what happens within Shariah Law adherent nations won’t boomerang on them. NOT only that, but it should be understood that dry runs for beheading, sanctioned under Shariah Law, has already debuted in their midst. MOST significantly, it is not a question of whether or not one believes the danger impinges upon the west. It’s a given. The open question is: are you willing to bet your noggin on it? This entry was posted in Uncategorized and tagged "religion of peace", “Libyan Cleric Boujela Justifies Beheadings and Body Mutilation “to Strike Terror in the Heart”, http://islamexposedonline.com/2015/06/24/shariah-law-the-art-of-beheading-an-islamic-mandate-western-nations-on-notice/, http://joeforamerica.com/2015/06/shariah-law-art-beheading-islamic-mandate-western-nations-notice/, Oklahoma’s recent beheading, Saudis use a long sword, Violence and intolerance envelop the Muslim world by Adina Kutnicki. Bookmark the permalink. Islam is a 1400 year plague on Humanity…the only redeeming quality is their desire to murder each other…Sunni verses Shiite…All I needed to know about Islam I learned on 9-11..! Now we have an enemy aiding and abetting Muslim Brother-Hood in the White House..! Pingback: Israel's Voice | Shariah Law & The “Art” Of Beheading: An Islamic Mandate. Western Nations On Notice.